Effectively removes graffiti and spray paint, permanent markers or ball point pens from plastered walls and concrete, stone, marble and metal surfaces, glass and tiles. Suitable for cleaning statues and monuments, educational institutions, building facades and children rooms. 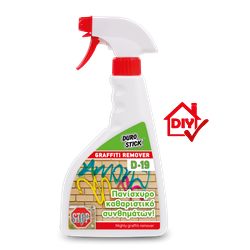 Ideal for cleaning graffiti from surfaces coated with the polyurethane paint DUROSTICK ANTIGRAFFITI. There is no reason to repaint those surfaces because the paint remains unaffected, even after repeated cleanings.